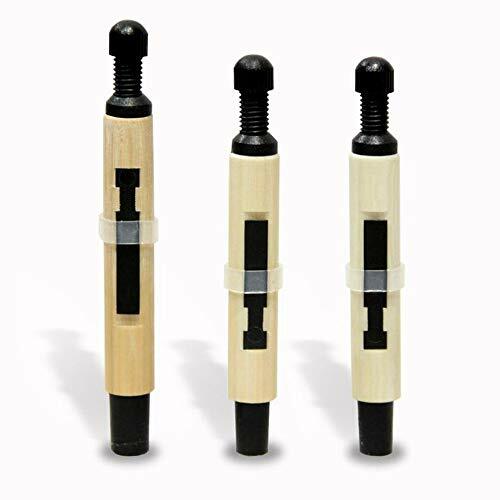 The Selbie Synthetic Drone Reeds are designed to provide the stability of a synthetic reed while providing the tonal qualities found in the finest cane reeds. One of the main features of the Selbie reed is the unique tongue system. The T shape formed tongued fits into the precision engineered reed body. This eliminates the need to glue tongues to the body. It allows the tongue to be removed and cleaned of any residue or seasoning if a reed were to fall into the pipe bag. It can then be refitted to the reed body and set to its original position. Black waxed hemp can be added to the rubber sleeve to ensure a secure fit. Prior to dispatch, the reeds have been tested for pitch and strength, and are delivered with instructions on how to fine tune the reed to obtain the perfect balance between chanter and drones. Selbie Drone Reeds are steady, easy to strike in and tune, air efficient, moisture resistant, and have exceptional tonal quality. In addition, each set of reeds are personally tested by Neil before they are sold. They have easy-to-use tuning screws and rubber band bridles. Made by Neil Selbie & Co. Designed by Neil Selbie. Band quotes available upon request – Please contact us for details.